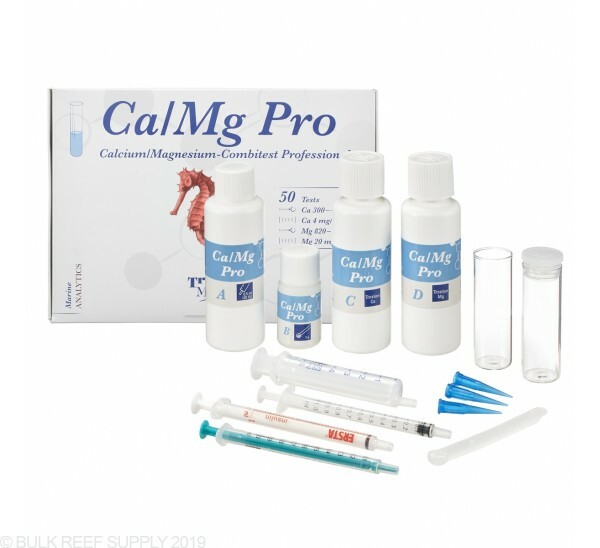 Calcium and Magnesium are two of the top key components in seawater and having them at the proper levels is imperative to proper coral growth. As corals grow then will consume calcium to build the calcium carbonate skeleton, while magnesium will be consumed much slower, but is mainly used to keep calcium and carbonate from precipitating out at the levels required by a saltwater aquarium. The high-resolution calcium and magnesium tests include everything required to make repeatable and reliable results. Each test only takes a few minutes and regularly testing your calcium and magnesium will really let you know how your coral is growing, and allow you to fix any issues before they become a larger problem. Note: The calcium concentration is determined first, and then the magnesium concentration is determined using the same sample. Shake the bottles before use! Place a clean dropper tip onto the 1 ml dosing syringe with red lettering and draw out reagent A up to the 20 mark on the syringe (corresponds to 0.5 ml). Empty the entire amount into the cuvette with the analysis sample. Close the glass cuvette using the stopper and briefly swirl the solution. Then mix reagent B (powder) with the measuring spoon and add 1 level measuring spoon of reagent B to the glass cuvette containing the analysis sample. Swirl the cuvette carefully until the powder has dissolved. The water sample will turn light-blue. Place another clean dropper tip onto the 1 ml dosing syringe with black lettering and draw out 1 ml of reagent C.
Now add reagent C from the syringe to the analysis sample drop by drop until the light-blue solution becomes colorless. Swirl the cuvette after each new drop. To assist in detecting the color change, take the comparison sample (the second cuvette you prepared at point 3) on a white surface and look into both cuvettes from above when they are sitting side by side. You can stop adding drops when the color change is complete and there is no difference between the analysis sample and the comparison sample. The residual volume of reagent C in the syringe shows the calcium concentration CCa in mg/l (ppm) that can be determined using table I. Example: If the lower side of the syringe plunger is at 0.46 ml following titration, then the residual volume of reagent C is 0.46 ml. 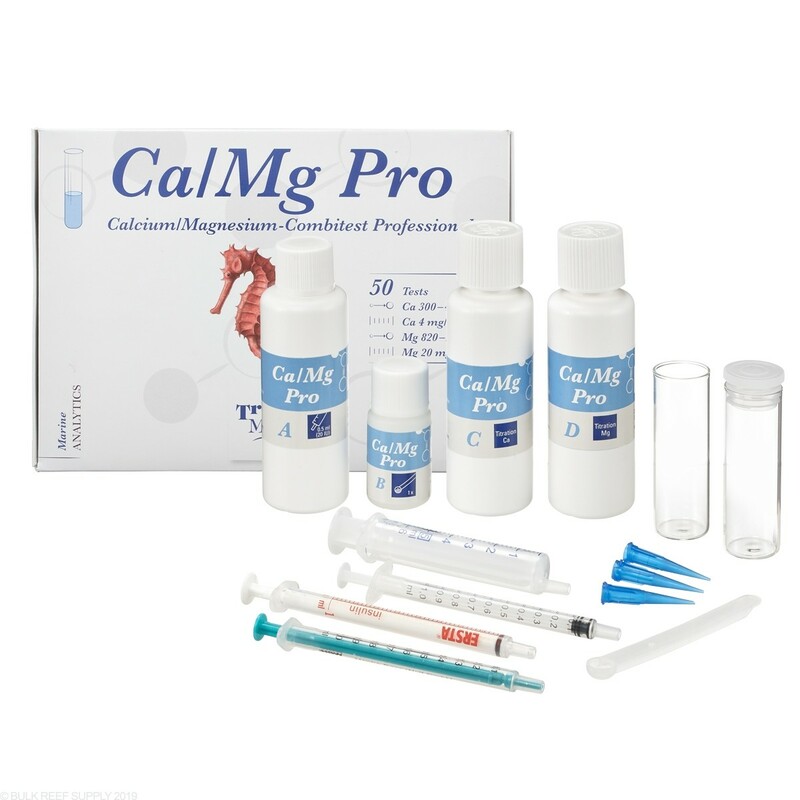 The calcium concentration in the sample is: Ca = 392 mg/l. The residual volume of reagent C in the syringe can be put back into bottle C.
Place the third clean dropper tip onto the 1 ml dosing syringe with the green plunger and draw out 1 ml of reagent D.
Add approx. 0.4 ml of reagent D into the water sample. The water sample will turn light-blue again. Now add the remaining reagent D from the syringe to the water sample drop by drop until the light-blue solution becomes colorless*. Swirl the cuvette after each new drop. To assist in detecting the color change, take the comparison sample (the second cuvette you prepared at point 3) on a white surface again and look into both cuvettes from above when they are sitting side by side. The residual volume of reagent D in the syringe shows the magnesium concentration CMg in mg/l (ppm) that can be determined using table II. Example: If the lower side of the syringe plunger is at 0.35 ml following titration, then the residual volume of reagent C is 0.35 ml. The magnesium concentration in the sample is Mg = 1300 mg/l (ppm). The residual volume of reagent D in the syringe can be put back into bottle D. Rinse out the glass cuvettes, dosing syringes and dropper tips thoroughly with tap water and allow to dry before using them again. * Note: If the color change from light-blue to colorless is difficult to detect, we recommend to carry out the measurement under a bright light source which is similar to daylight. No way you can see the color change on this. It is almost clear and you have to tell when it turns clear. Worst test I have ever used. Disappointed in brs for even carrying it! Maybe I just can't operate the test correctly, but the results I get from this test kit do not match any of my other test kits and do not even match when I run the test twice in a row. For example, my API and Salifert tests come up with 440 and 420 respectively. This test kit, run twice in a row, gave me 360, then 480! For magnesium, I got 1400 and 1280 with this kit and 1320 with my Red Sea kit...... I would not recommend this kit to anyone!